At first glance, Cocoa Cinnamon (or Cacao Canela, depending on which side of the building you’re facing) in Durham, North Carolina seems your usual eclectic coffee shop with mismatched couches, random trinkets dispersed on the counters, and a funky crowd. But if you dive deeper, either into the menu or into conversation with one of the baristas, you learn this small shop beautifully connects modern-day Durham to another world entirely. To be fair, Cocoa Cinnamon is more than a coffee shop. It’s a coffee, hot chocolate, tea, wine, beer, and treat shop. Along with featuring single-origin and blend coffees from various roasters, Cocoa Cinnamon also sources single-origin chocolate, teas and tea infusions. They have been gaining plenty of attention, too. As winners of 2014 Indy Week for best coffee shop in Durham County, Cocoa Cinnamon is preparing to open a second shop in town within the year. So how do co-owners Leon and Areli Barrera de Grodski tie these elements together? Each drink is a small piece of world history, as explained through the spice trade. “Created our world” is no over-exaggeration. The spice trade was the first real example of global commerce. Centered in the ancient Middle East, Arab merchants and rulers managed highly-coordinated markets with high demand and controlled supply. While Arab ships were sailing directly to spice-producing lands before the Christian era, it was the European search for spice routes that connected Europe and Asia to the Americas. Each signature drink dons a name and tells a story from the Spice Trade or subsequent history. For example, we have the Temüjin, a white chocolate latte topped with ginger. Temüjin is the birth name of the great Genghis Khan, whose Mongol expansion across Asia in the 13th century reestablished the Silk Road trading route. The Moctezuma – a latte with Dulce de Leche and cayenne pepper – is named after the king of the Aztecs at the arrival of Cortés in 1519; and the Tenochtitlan is a hot chocolate drink with cayenne, vanilla powder, and agave named for Aztec capital city over which Moctezuma ruled. The spices used in each drink reflect the region from which the name is contrived. Some history is a little more recent, but no less impactful. The Aleppo Souk is a latte with cinnamon, cumin, nutmeg and topped with paprika and Aleppo pepper. It is named after the ancient/modern city of Aleppo, Syria, one of the oldest continuously inhabited cities in the world that was once a key destination on the spice trade route. In 2013, Syrian government forces bombed a city market—or a “souk”—on a busy day, killing close to two dozen people. The Aleppo Souk latte memorializes those lost in that market and includes ingredients that would have been found there. 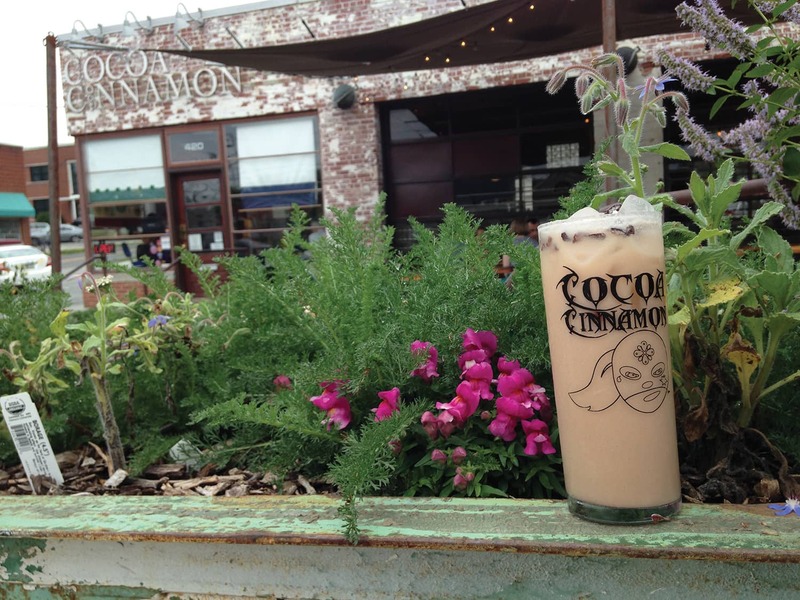 And still, some of Cocoa Cinnamon’s drinks honor the land upon which the shop—and the city—sits. During my visit, Baristas Kaley and Kelly recommended the Dr. Durham, a latte with homemade vanilla syrup, moka powder, ginger, and topped with black lava salt. It is named for Doctor Bartlett Leonidas Snipes Durham, who donated land for the city. The drink’s hot ginger, sweet vanilla, and savory salt all bid for the attention of my taste buds, but in the end they were all quite satisfied. Both ancient and modern histories are represented here, as well as lands close and far away. Maybe Durham isn’t listed in any history books as a destination on the spice trade route, but Cocoa Cinnamon has helped make this city a coffee destination, period.